Mrs. Winifred Ekanem Oyo-Ita (nee Nyong) hails from Adiabo Okurikang in Odukpani Local Government Area of Cross River State, and was born on the 20th of April, 1964. Mrs. Oyo-Ita Winifred had her Secondary School Education at Queen’s College, Yaba from 1974 – 1980 and Advanced Levels at Federal Government College, Malali, Kaduna before proceeding to the University of Lagos where she studied and obtained a BSc. (Hons) Degree in Accounting in the year 1984. She also holds a Masters Degree in Public Administration from the Nasarawa State University. She is a Fellow of the Institute of Chartered Accountants of Nigeria (ICAN). Winifred has an impressive and well documented work experience spanning over 30 years, including being the first female Indigenous Managing Director/CEO of Cross River Estates Limited, between 1993 – 1995. She later transferred her service to the Federal Civil Service where she was appointed to the rank of Assistant Director in July, 1997 and rose to the position of a Director, Finance and Accounts in January, 2009 in the Office of the Head of Civil Service of the Federation. 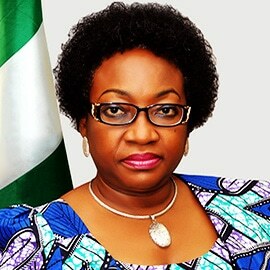 Mrs. Oyo-Ita Winifred was appointed to the position of Federal Permanent Secretary on the 16th of March, 2013 and posted to the Federal Ministry of Special Duties and Inter-Governmental Affairs as the pioneer Permanent Secretary of the re-established Ministry. She was redeployed to the Federal Ministry of Science and Technology in April, 2014. She was appointed as the Head of the Civil Service of the Federation in acting capacity in October 2015 and confirmed in January 2016 by President Muhammadu Buhari, GCFR. Winifred is a proud mother of three sons, a grandmother, a foster mother and a guardian to several children, adolescents and young adults. Winifred is a community leader, and strongly committed to serving God and humanity.